Introducing Red Clover Extract, this highly potent plant extract will not only help improve liver health, but has an array of other clinically proven health benefits. Everyone: bodybuilders, athletes, and even your average Joe’s need to be taking Red Clover Extract. It obviously helps bodybuilder’s and guys who train hard, but who wouldn’t want to have an extra insurance policy on your health? 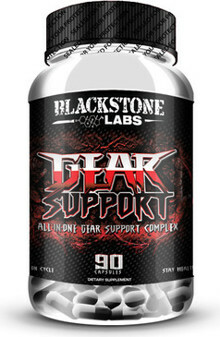 Find this key ingredient and several others in our new product, Gear Support. Pick up a bottle of Gear Support and like every other Blackstone Labs product, try and find something you don’t love about it. Red Clover Extract – Red clover is a wild plant belonging to the legume family. Cattle and other animals graze on red clover. Health care practitioners also believe that red clover purifies the blood by acting as a diuretic and helps clear lungs of mucous, improving blood circulation, and helping cleanse the liver. NAC (N-Acetyl-Cysteine) – NAC is an antioxidant derived from the amino acid L-Cysteine. It has several beneficial attributes, but for our uses it will help to eliminate free radicals, neutralize toxins such as mercury. It will prevent damage to the liver and has also been shown to support lung and bronchial health and immune system function. Hawthorne Berry – It is a highly recognized herb for the heart and cardiovascular system. Hawthorne Berry has the ability to dilate (enlarge or open) the coronary arteries (the vessels that supply blood to the heart), thus improving blood and oxygen supply to the heart muscle. It also strengthens the heart’s pumping ability, helping to beat more forcefully and efficiently. In addition, hawthorne appears to dilate the highways of other blood vessels around the body allowing blood to circulate more freely with less strain on the heart. Saw Palmetto – Saw Palmetto's main action is to help prevent the conversion of testosterone to DHT. Celery Seed Extract – 3nB is the active compound that is unique to celery. Grape Seed Extract – This natural plant substance has a concentrated source of the antioxidant oligomeric proanthocyanidins (OPC). Grape Seed Extract has been shown to protect cells from free radical damage and to also promote healthy circulation. It is rich in polyphenols, a compound that’s high in antioxidants. Studies have shown OPC to be more powerful antioxidants than vitamin C, E, and beta-carotene.